This is a minor release to fix a single important bug in speed/height handling. The bug was in the TECS (total energy control system) and could cause a sustained pitch down due to a transient glitch in airspeed demand resulting in a large negative pitch integrator. The log that found the bug was of a quadplane in CRUISE mode, and resulted in the aircraft forcing nose down for long enough to crash. The fix includes both protections for the pitch integrator and a fix for the cause of the transient in airspeed demand affecting the TECS demanded airspeed. 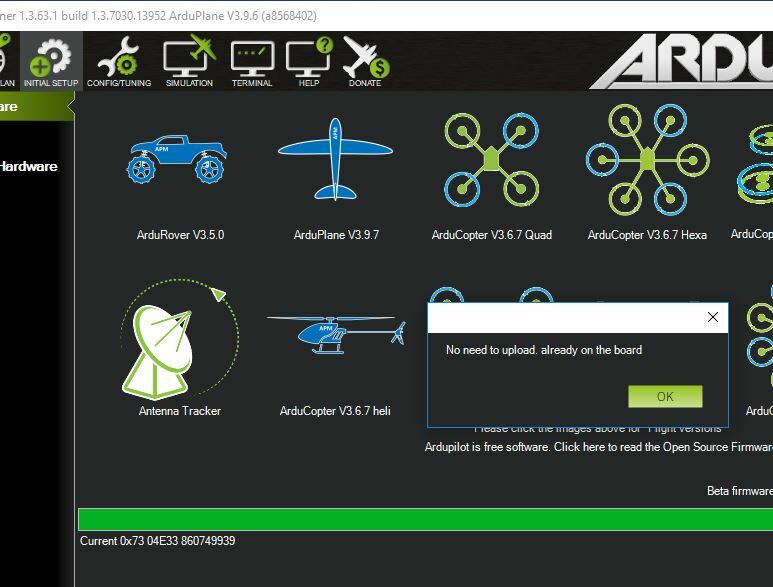 Many thanks to ArduPilot partner FoxtechFPV for reporting this bug! @Rolf, I suspect the build hadn’t finished yet on the server. I tested this morning with a MatekF405-Wing and it installed 3.9.7 fine. I suspect that I’m a victim of this bug. You can check the Log file, that log was for a previous fly. You can check that the plane lose altitude when hits certain amount of ground speed. I just built a plane with a Matek F405-STD board, but can’t find the 3.9.7 firmware for this board. The note in the Wiki documentation suggests using MATEKF405-STD firmware. How can I obtain the right firmware file? @Jan_Willem dedicated MatekF405 STD firmware versions have been added to master, but not to plane 3.9.7 release version yet. while the existing MatekF405 type firmware supports a variety of respective board variants, you‘ll likely have to check / adjust AHRS_ORIENTATION on STD board version with ICM20602, as opposed to older board types with MPU6000. can you give a link to the log? Firmware works fine. Tested with F405-Wing (ASW28) and Pixhawk 2 (MiniTalon Quadplane Conversion). tested on omnibusf4pro, matekf405wing and fmuv3, all working as expected. noticed full external baro support hasn‘t made it into this release (again). i like this feature a lot and have been regularly using it on master with excellent results. imho it‘d be great to have it added to release versions.